Artists much greater then I, have tried to describe themselves through their art or document their reality,Id or ego. I am trying to document my environment through my own perception. I believe the interactionist or viewer, that interprets the art for themselves,is the true artist.This could be a multi-cultural, multisensory or spiritual connection. We are as a whole, a wonderful humanrace. Indivually extremely imperfect,but given free will and creativity on the Creator's canvas, we are a wonderful art "work in progress" learning and evolving to a higher purpose. 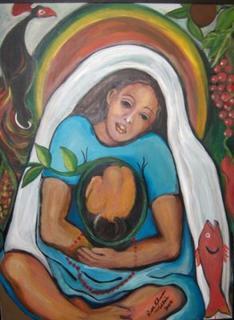 Mother Earth Gives Birth - Acrylic on Canvas - 30x40 - $1,800. Thanks for youe comment. I�m glad you like my painting. And I like yur work too.